Dutch shoe designer Marloes ten Bhömer has created a pair of shoes made of a single piece of leather folded round a stainless steel support. Called Beigefoldedshoe, the footwear will be presented at Spring Projects gallery in London on 16 July alongside conceptual projects by ten Bhömer. Spring Projects presents an exclusive evening with critically acclaimed designer Marloes ten Bhömer launching her first wearable shoes as well as exhibiting her other conceptual works. Marloes ten Bhömer launches ‘Beigefoldedshoe’, a shoe made from a single piece of folded leather and stainless steel heel construction, which stems from one of her visionary footwear concepts, transformed into a wearable shoe through two years of design and engineering development. Hand made in the UK, and incorporating technical expertise from international manufacturers, this special edition shoe, the first to be commercially launched by MARLOESTENBHÖMER®, is a truly unique product. Alongside the launch of ‘Beigefoldedshoe’, she will present a specially shot film and photo installation. Ten Bhömer, a London based Dutch product designer, graduated from The Royal College of Art. She is considered one of the most promising designers of her generation and has exhibited worldwide. Most recently she was nominated for the Brit Insurance Design Award 2009 held at the Design Museum. ‘Ten Bhömer’s experimentation with new shoes typology began when she was a child and slavered an old pair of her mother shoes in a paper-mâché to exaggerate their shape. Twenty years later, when looking for a way to create a shoe of varying thicknesses, the Dutch designer remembered her mothers’ heels and began to experiment…’ (Wallpaper Magazine, 2005, edition 37). 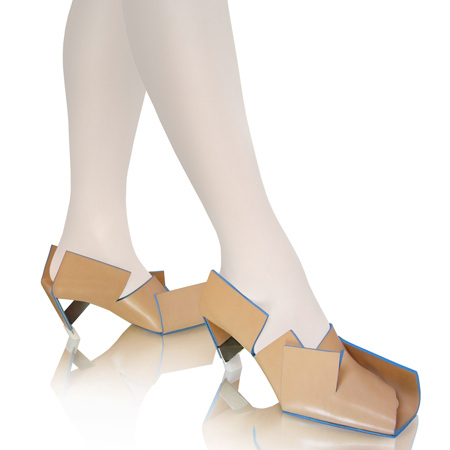 Ten Bhömer’s shoes are both provocative and otherworldly; Her works question our perception of functionality, fusing art and technology to create an origami like production, working with materials ranging from wood to polyurethane resin, tarpaulin, steel and fiberglass. The evening provides insight into her methods of creation, showing the end result of her fascinating use of materials and forms of construction, rarely seen in shoe design.